So. Atlanta. Hey, at least I’m finishing the recap before the end of the month (barely)! Post-food-coma, G & I met up with a friend for breakfast on that Saturday, but the food was incredibly crappy (seriously bad) and it’s just not worth talking about on here. Heading to Atlanta and want to know where to *not* get breakfast/brunch? Drop me a line, I’ll fill you in. Afterwards, even though G was stuffed, I dragged him off to Sublime Doughnuts to get a sampling of “one of America’s best doughnut shops.” Dang. Gotta be good to be mentioned among the likes of Voodoo Donuts & Cafe du Monde. 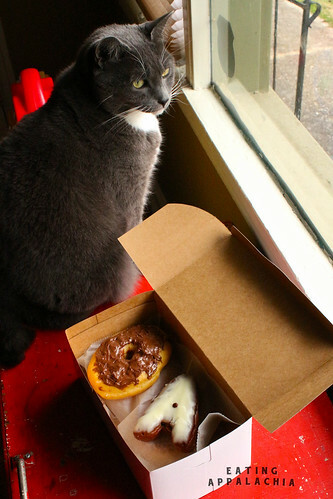 The super fantastical kitties we were cat sitting modeled half of the donuts–A-Town Mocha and the infamous Nutella–but even with their furry cuteness, I just couldn’t fall in love with either. The Nutella was hands down my favorite, but who on earth doesn’t love Nutella slathered on something, especially a basic yeast donut? But it wasn’t out of this world. And the A-Town Mocha? It was just sweet. Nothing else. Eh. Not impressed. 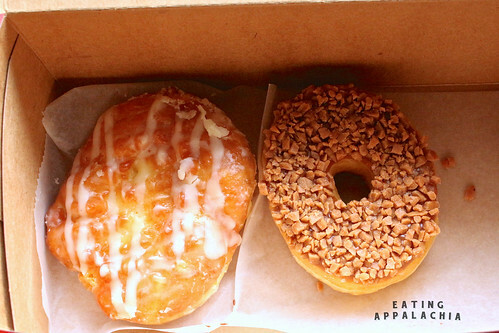 As for the other two–White Chocolate Peach Fritter and Butter Toffee with Caramel Icing–I couldn’t eat more than a bite. (Same for G–and he’ll eat anything instead of throwing it out.) Sweet on sweet on sweet. No hint of peach in the peach fritter, nothing but plain sugar in the toffee. I don’t know. Just not impressed. And while one friend lauded their prices–$1.25-2/donut–at just a few cents more, I’d go for anything from Revolution Doughnuts hands down. A little bummed from the donut flop, we headed off to see the man we drove to Atlanta to see: Seamus motherflippin Heaney. Yes. THE Seamus Heaney. In all his wizened, old man Irish poet goodness. I wrote half my undergraduate thesis on his poetry (half on Roger Deakin, a British nature writer) and Heaney is, by far, the greatest influence on my own poetry. To actually see him read was beyond phenomenal. Even if that dude’s head kept getting in my way (I was only 4 or 5 rows back). And the best part was that he told little stories about each poem as he read–amazing to hear all that background to poems I’ve read countless times. Totally worth the 7 hour drive. Post-Heaney, um, snacks, duh! I’d hoped to run into friends at the reading, but the auditorium was so full that I couldn’t find anyone. But, companionless, G & I headed over to downtown Decatur to one of my favorite mid-afternoon beer and snack places: Leon’s Full Service. A converted gas station, Leon’s is a beautiful place to grab a pint and a bite to eat–tons of windows let in light, the bar is open and the bartenders friendly, and the tap list is always excellent. I opted, first, for a Breton cider to go with the required fries and dipping sauces, and then moved along to a beer. 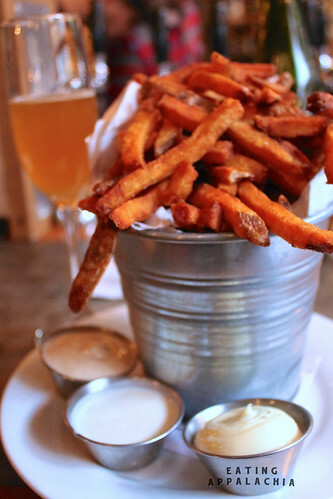 The fries, you see, are a must–ultra crispy but not too thin, they’re pillowy on the inside and distinctly potato-y. And the sauces? They have fifteen or something on the menu. I can personally vouch for the curry catsup, BBQ, goat cheese fondue, smoked tomato mayo, bacon herb mayo, and garlic aoili. All amazing. All made in-house. All worth trying. But a snack is just a snack, you know? One has to eat some dinner. Somehow. Even though you’ve just spent the entire weekend eating. Dinner was on the fancier side at a restuarant I know (and love) well: Floataway Cafe. During my last two years in Atlanta, I often went to Floataway for special occasion dinners. Though I was vegan at the time, I could always pick my way through the menu and I always walked away satisfied. This time, fully omni, I planned on taking full advantage of everything offered. 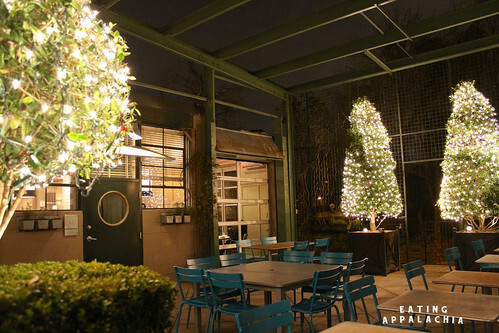 Tucked away in the back of an Industrial Park just past Emory University, Floataway is in a weird location, but that adds to some of it’s charm. I’d always before eaten on the patio (magical), but given that it was 30 degrees, we obviously sat inside. The decor has changed since I was last there and while I remember a light-filled, modern, sparse restaurant, it now feels like Pottery Barn threw up in it. Major minuses for the ambiance. If I was a suburban 50 year old, I might have liked it, but, seriously, Star Provisions/Floataway, what the heck were you thinking? Thankfully, it’s not all about the look of a place. It’s actually about the food. And our starter of local lettuce, radish, toasted focaccia, gorgonzola, and buttermilk vinaigrette was amazing. 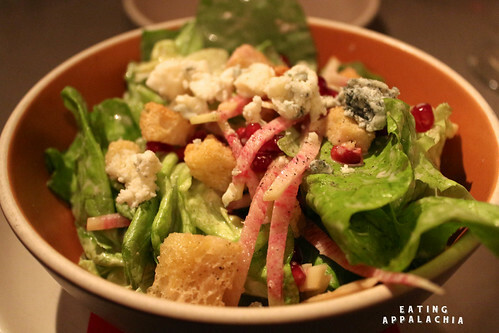 Even though it was “just a salad,” the buttermilk vinaigrette and gorgonzola really amped up the acidity to a nice degree, the radishes and lettuce cutting it with some sweetness. It was a perfect reminder that it’s supposedly Spring somewhere (a reminder I desperately needed). My experience with Floataway is that their vegetable dishes are bar none–this salad lived up to expectations. 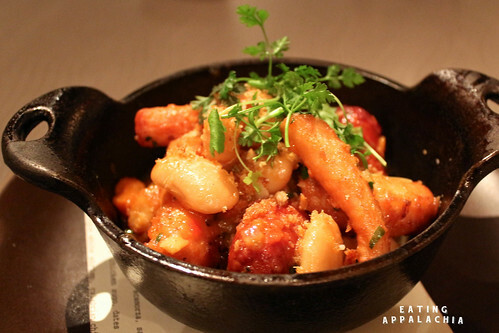 Next, the octopus cassoulet, calabrian sausage, and corona beans. Call it a precursor to our Barcelona trip in May. Plus it was a rather wintery night and nothing says hearty warmth like cassoulet. G was skeptical of the octopus (he’s had it cooked poorly before), but this dish was phenomenal. The octopus was moist and tender with only a slight chewy texture (more reminiscent of a scallop than anything else), the sausage spicy, and the beans cooked perfectly. Though it sounds so simple, the flavors were complex, ranging from a deep salty, woodsy flavor to a bright, heat from peppers. I could have eaten a much larger portion of it to be sure. 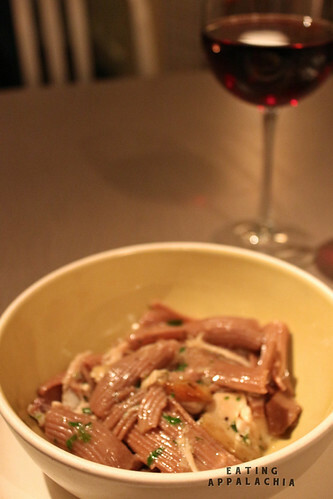 And, finally, a pasta dish that is no longer on their menu so I can’t recount it all. Whoops. From what I remember, it’s a chestnut pasta with chicken in a buttery white wine sauce. Or something like that. Whatever it was, it was both filling and light at the same time, the chicken moist, the pasta nutty–another home run for a cold night. While the decor at Floataway may have changed for the worse, the food certainly hasn’t and I’m still going to consider it a favorite restaurant of mine. The service was fantastic (once we were seated–beforehand we had to awkwardly stand in the entrance for 15 minutes to wait for our table–even though we were on time for our reservation), and the prices really aren’t bad if you share plates. It’s definitely a restaurant I’d love to have closer to me! The next morning found us needing to head back home, but first we did grab a bite to eat at Ria’s Bluebird for breakfast. Though the before mentioned Bionic Breakfast is one of my favorites, I opted for the unbelievably fantastic Country Fried Tempeh served with gravy, a grilled tomato and sautéed spinach over a buttermilk biscuit. Seriously good food. 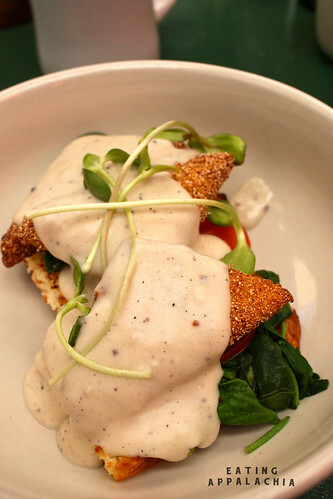 Nutty fried tempeh, rich vegetarian gravy, and the fluffiest biscuit you could imagine? Now that is a meal I miss. And that finished up Atlanta. Sigh. I’m so homesick all the time lately. But! On the drive home we did need lunch. And Charlotte was the perfect midpoint for a late meal. G felt like Mexican, so I did a little Yelping and came up with El Taco Veloz, conveniently located just a few miles off our route. I don’t know what I was expecting (something more Gringo, maybe), but we were pleasantly surprised to find the restaurant pretty damn authentic. 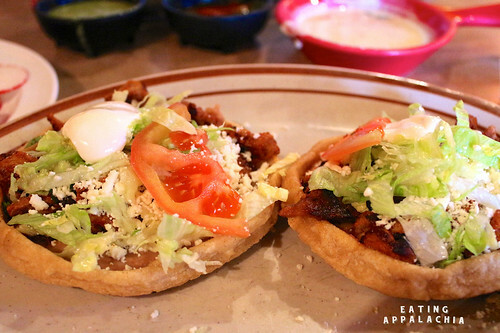 A sope fanatic, I ordered the Sopes al Pastor and, yup, pretty awesome. They obviously make the masa in-house and the al Pastor was rich, a tad spicy, and plenty tangy–perfect with the cojita, beans, lettuce, and tomato. I splashed some of their hot sauce/salsa on top, as well as a few radishes, and was good to go. Oh, and they give you a small bowl of queso for free with your chips. They definitely know the way to my heart. And with that, we were off north for Roanoke, and the rest of March–some of which, I promise, will make it on to the blog sooner than later! Ohhhhh! 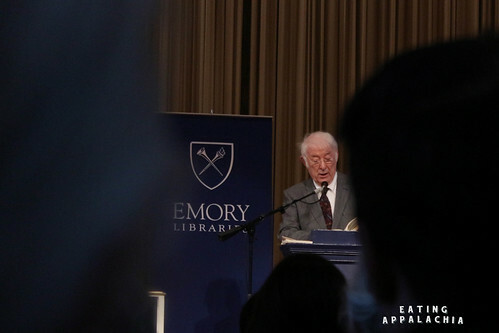 Seamus Heaney live! And gorgonzola! And chestnut in your dinner! I’m so envious. geez. if i’m gonna eat a donut, especially if they claim to be one of the best in the country, i want it to be worth the calories. how disappointing! those fries on the other hand look absolutely perfect, as well as the tempeh dish! 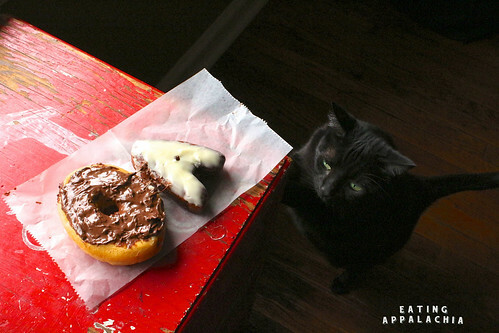 You know, I have never understood what the big deal is about doughnuts. I can name two doughnut shops total that have doughnuts I want to eat, and the rest are all OMG SUGAAARRR. On the other hand, SOPES!